Table leaves allow you to update your dining room in minutes. Take leaves out to create an intimate seating arrangement or insert leaves to provide more seating for guests. Change the look of your dining room to accommodate guests no matter the size of the party with the use of extension leaves. Few things make a more regal statement than the artful blending of traditional and contemporary designs as seen with this 11 Piece Castel Harbour Dining Table, Mill Creek Side Dining Chairs, and Aqua Bay Arm Chair Table set. At first glance, this table may appear simple in design, yet fine details such as cantered parsons legs,and fine raised outline on legs and apron bring it to life and balance with the exquisite, detailed design of the surrounding collection chairs. 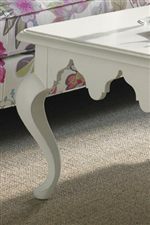 The Somers Isle finish creates a vibrant, fresh look, while hints of parchment highlights offers a feel of vintage charm. With two 20 inch leaves, this table can seat up to 10 people quite comfortably, making it a wonderful solution for large dinner parties. The eight Mill Creek Dining Side Chairs simply embrace traditional exotic influences while keeping a sense of sophistication. 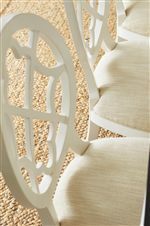 The chairs feature curved front arms, and a decorative oval back with a quatrefoil diamond pattern. 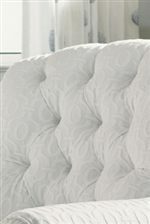 A slight concave on the oval backs enhance the comfort and offer an inviting look. Two Aqua Bay Arm Chairs finish the table set look, providing a pop of color with its upholstery and gracious silhouette with sloped arms. Altogether the white finish and vibrant design create a fresh island vibe perfect for an casual and elegant dining setting. The Ivory Key 11 Piece Rectangular Castel Harbour Dining Table with Mill Creek SideChais & Aqua Bay Arm Chairs by Tommy Bahama Home at Reeds Furniture in the Los Angeles, Thousand Oaks, Simi Valley, Agoura Hills, Woodland Hills, California area. Product availability may vary. Contact us for the most current availability on this product. 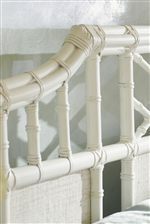 Finish & Paint Options Somers Isle 543: Casual transitional designs crafted from select hardwoods and woven raffia in a crisp white coloration with subtle parchment highlights. 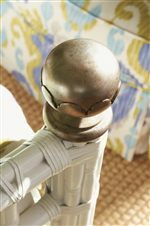 Handles & Hardware Custom hardware is finished in an aged silver patina. Description: Top Tops in this collection feature a Somers Isle finished top, woven raffia top, and inset glass top with fretwork underneath. Case Construction This collection is crafted from select hardwoods and woven raffia. Select Items contain glass tops. 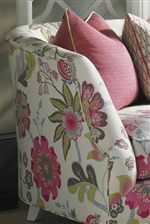 Warranty As long as the original purchaser own the upholstered furniture, the frame is warranted by Lexington Home Brands against defects in materials and workmanship for 5 years if upholstery is the original material & is used under normal conditions. Inspired by the pastel homes, crisp whitewashed roofs, and lush landscape of Bermuda, Ivory Key embodies the casual and colorful side of Tommy Bahama. Borrowing stunning design elements from British, European, and Moroccan design, the collection simply creates an artful blend of traditional and contemporary furniture rich in history. Traditional elements like the distinctive Moroccan quatrefoil design blend effortlessly with natural materials like woven raffia and leather-wrapped bamboo to offer a spirited take on refine island living. 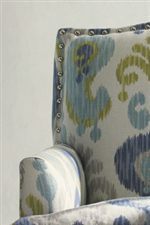 The finish is a crisp linen white coloration with hand burnishing, which highlights a fresh palette of captivating island colors in the collection's assortment of custom upholstery. The look is elegant and sophisticated but the vibe is casual and cool - a remarkable lifestyle that reflects the essence of traditional roots, casual lifestyle, and comfortable living. 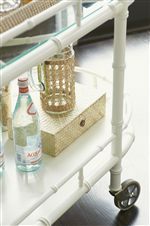 The Ivory Key collection is a great option if you are looking for Tropical furniture in the Los Angeles, Thousand Oaks, Simi Valley, Agoura Hills, Woodland Hills, California area. 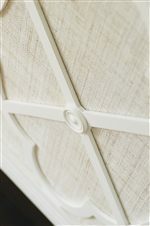 Woven Raffia in Soft White Finish Takes on a Sophisticated Look of Natural Linen. Browse other items in the Ivory Key collection from Reeds Furniture in the Los Angeles, Thousand Oaks, Simi Valley, Agoura Hills, Woodland Hills, California area.